We now live in a world where it is fashionable to reuse and repurpose old things. It is popular to take pieces of one thing and put it together with pieces of something else to make something new. Having the scattered and creative brain that I do my mind cannot function well on concentrating on just one thing for my creativity. I find myself engrossed in writing a story and all of a sudden I see or hear something and an idea pops into my head. It is stuck there in a vision. I take my vision to the sensible person in my household and he doesn’t see it. Now there are occasions where I can create my vision myself such as the wall I am working on in my writing room. I am papering it with old book pages. What better inspiration for a writer? But then, there are the projects that I cannot do by myself because I do not have the skills. I can see a bench seat made out of my old radiator cover. 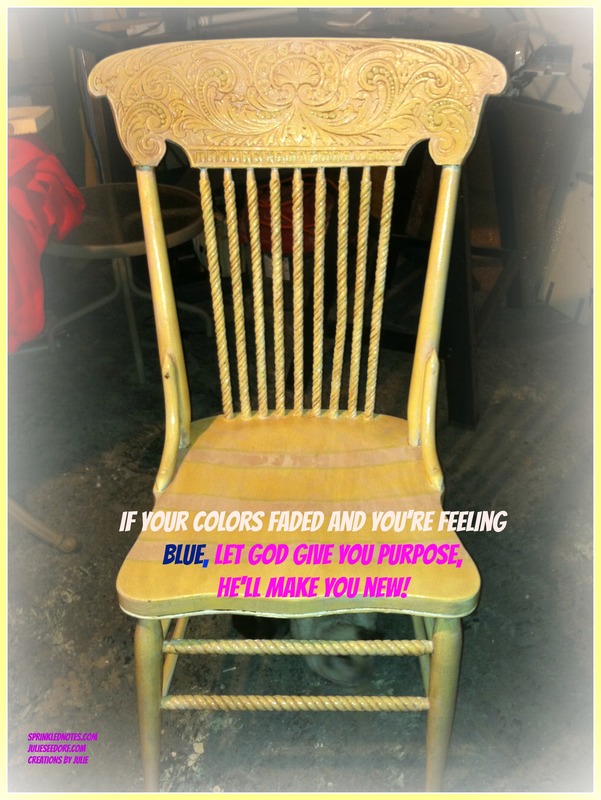 I see color and beauty in old dilapidated chairs and dressers. I see wall art made with old computer pieces. My heart beats fast and juices flow at the thought of old made new. I felt very alone in these ideas until recently when a friend changed the venue of her store and another friend retired from her job. All of a sudden I have other people that get it. The store sells old and unique furniture. It is called Second Chances and it is all of that. The store has been in my community for years but recently the store has changed focus, and it values all that has been and all that the pieces could be. Because of these new people in my life, the more conservative person is actually seeing my vision from time to time, such as when he helped me haul home an old tin kitchen cabinet that needs some indenting and some scouring and painting. I think the “aha” moment came for this conservative person when he realized there were more like me. I bought a bed from my friend’s store. They delivered it. We asked if they wanted to take our old downstairs vanity and lights. I had dreams of taking that cabinet, putting a new top on it and finishing it off with one of those cute sinks that sits on top of the cabinet, making a new vanity for my upstairs bathroom. The vision didn’t seem to be there for my better half. As the vanity was being taken to the truck one of the women turned to me and said, “It’s not that we don’t want this, but why don’t you paint it, put a new top on it and one of those cool sinks on top of it for a vanity for you?” Can you see my smile as I describe the moment? My retired friend has an eye for taking unusual pieces and making them into a beautiful piece of furniture that is unique. I love scouring the countryside with her to see what she is going to pick up next. She repurposes things that the rest of us would throw in the trash. I do have another little piece of furniture that I have tucked away out of sight until I can create my magic. I actually dug it out of a dumpster. It is an old music cabinet that is sturdy but badly in need of a redo. The bones are good. Yes, people who love to make new out of old, do dumpsters. I have never felt totally at home in a perfectly decorated tasteful home. I like to visit those perfect places such as bed and breakfasts, but my taste is a jumble and right now being jumbled is in. Things don’t have to match, and different patterns and colors are thrown together and somehow they work. We feel guilty if our lives are a jumbled mess. Isn’t that what living is all about? We tumble through life, picking up pieces new and old, putting them together to go forward to the future. We carry the old parts of us forward in life, mix it up and it makes us who we are today. I accept that I am jumbled, that my creativity gets in the way of doing one thing at a time. It is when I fight accepting that I cannot be the one-thing-at-a-time person that my life becomes weighted down with expectations of myself that I can’t fulfill and I get frustrated. I suspect it is the same for my Mr. Conservative. He is the one-thing-at-a-time person. We work hard to meld the two together for a working relationship. However you tumble and jumble, however you mix and match, reuse and repurpose whatever it is in your past and mix it with the new from the future. It will be uniquely you. Next Remember Mikey? Try It, You Might Like It? Life Cereal.